Live from CES in Las Vegas, Fujifilm has just announced a new rugged FinePix camera in addition to several new premium colors variants for their award-winning X-Pro2 and X-T2 cameras. The Fujifilm FinePix XP120, successor to the XP90, combines a 5x optical zoom lens and 16.4-megapixel sensor in a very rugged camera body. The XP120 is waterproof up to a depth of 65 feet (20 meters), 15 feet more depth than the XP90 was rated for. Further, the XP120 is shockproof to 5.8 feet (1.75 meters), freeze proof to 14° F (-10° C) and dust proof. Capable of recording Full HD video at up to 60 frames per second and shooting full-resolution JPEG stills at up to 10fps, the XP120 is ready for difficult shooting situations, on land or underwater. The camera has a new "cinemagraph" mode, allowing users to shoot still images that contain moving elements. Further, the camera is equipped with 360° motion panorama and time-lapse shooting modes. The Fujifilm XP120 will be available in late February for US$230 (CAD$240) in four color options: blue, green, sky blue and yellow. 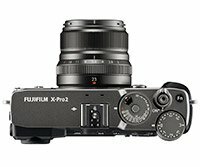 The Fujifilm X-Pro2 Graphite Edition uses a special multilayer coating method to give the camera body a dark gray finish. Further, there is a black pigment in the top layer of the coating, which Fujifilm says gives the camera a "rich metallic texture." Accompanying the camera body is a "graphite" Fujinon XF 23mm f/2 R WR lens with a matching LH-XF35-2 lens hood. The X-Pro2 Graphite Edition will release in late January for US$2,300 (CAD$2,900). Similar to the earlier X-T1, Fujifilm will release a Graphite Silver edition of its successor, the Fujifilm X-T2. Unlike the X-Pro2 Graphite Edition, the X-T2 doesn't come with a matching lens, but instead comes with a variety of matching accessories. The X-T2 Graphite Silver edition includes a premium leather strap, aluminum hot shoe cover and a matching hot-shoe mount flash. The distinct graphite silver finish is the result of a multi-layer coating process which is triple-baked to "produce an elegant and tactile finish." The first layer is a matte black undercoat, which is applied directly to the magnesium top cover of the camera body. The second layer applies a graphite silver finish and the third layer is a clear varnish. The X-T2 Graphite Silver Edition will be available in late January for US$1,800 (CAD$2,200).